My blog friend Ardyth, at a loss for something to do after organising anniversary cards for Darnell, and wedding photos from everybody, has come up with a challenge in honour of her first blogaversary. Take the first card you ever posted on your blog, flickr, splitcoasters, wherever, and CASE it. For my CASE version I stamped the image without the sentiment, coloured the ruffle skirt red, keeping the colouring patchy to complement the scribbly image, then trimmed and mounted the piece onto black card, and added a different sentiment. So, roll back to your first card, CASE it and link up on Ardyth's sidebar. Fittingly, the theme at Less is More this week is FRIENDS. 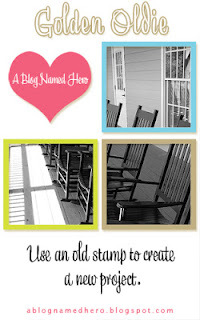 The challenge at A Blog Named Hero is to use an old stamp to create a new project. And the challenge at Dynamic Duos is to use red and black (with an optional valentine theme). Wow!! Love that stamp and both versions of your card. I daren't look at my first post - too awful! Oh wow! Way to combine all those challenges! I'm so glad you played along, Shirley! 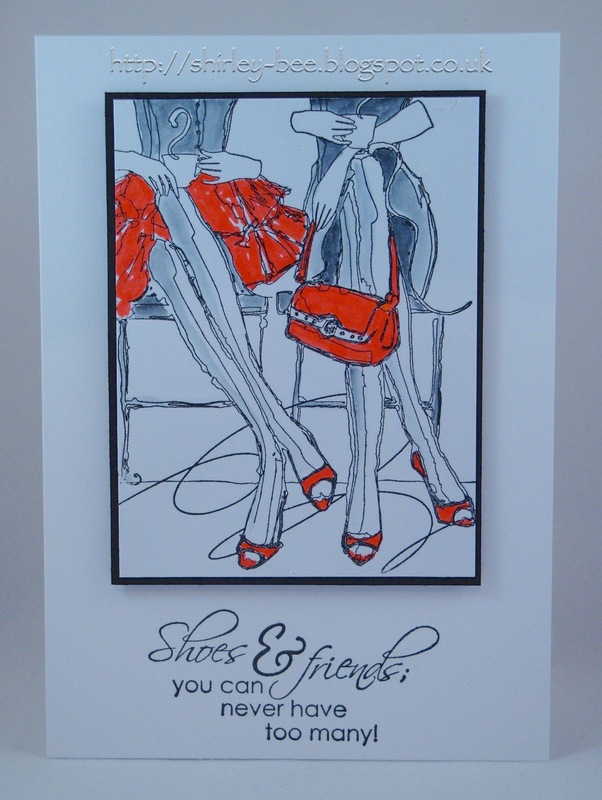 I love the pops of colour on that image - the perfect treatment and the perfect image for a friends card! Both versions are great. This reminds me I have some stamped images like this - now where are they? This is a really cute card...great card for the challenges. I don't think I want to look at my first card. I'm sure it's awful, what an interesting challenge...must go take a peek. A great remake! I love the image, and especially the 2nd sentiment! Well, if this isn't a saying after my own heart! What a fun card! 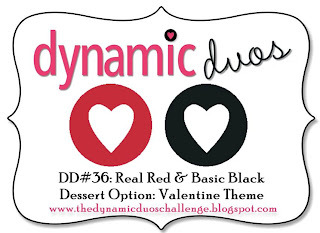 Thanks for playing along at Dynamic Duos this week! Wo, I love them both = what an amazing card for your 1st post! I was surprised to see that you've been blogging for less than a year. Winner. Period. You have the coolest images, Shirley! I love this one both ways! Way to go making your new card nail so many challenges!! Tres chic!!! Thanks for playing with us at A Blog Named Hero!!! you are right about the shoes shirley!! Oh I love that stamp..... I love your original and the new version! What a brilliant image with terrific sentiments! What a BRILLIANT stamp - love how you've highlighted it with bold colour too. I love the wonderful pops of red and the patchy application. It's a superb card. What a fun card! Love the sentiment - so true!! Thanks for playing along with Dynamic Duos this week! What a fun idea, casing your first card. Such a fun image! Thanks for playing with the Dynamic Duos.